Hide files and folders from the prying eyes of other people using your Mac. Secret Folder is very useful to keep your information away from prying eyes, it conceal folders and files on your Mac with a click, it provides you with an easy and fast way to hide personal folders and documents. The answer is simple: with Secret Folder! Secret Folder provides an easy and fast way to protect personal documents and avoid them being seen, modified, or erased by other users. It allows users to hide folders and their contents. Files and folders can be added by means of a single click on a choose dialog box or via drag and drop. This protection system is based on the principle that no person will attempt to open a file he/she cannot see or knows about. Secret Folder constitutes the perfect solution if you wish to prevent occasional users of your Mac to view, open, or change files or documents while browsing the contents of your hard drive. Secret Folders is very useful to keep your information away from prying eyes or kids who may accidentally modify or delete your files. The ‘Require Password’ check button lets you protect the app with a password. If this option is selected, at the opening of Apimac Secret Folder a password dialog box will be displayed. To gain access to the application it will be necessary to enter the correct password. Secret Folder is very useful to keep your information away from prying eyes, it conceal folders and files on your Mac with a click, it provides you with an easy and fast way to hide personal documents. The most simple and straightforward method to protect a file. 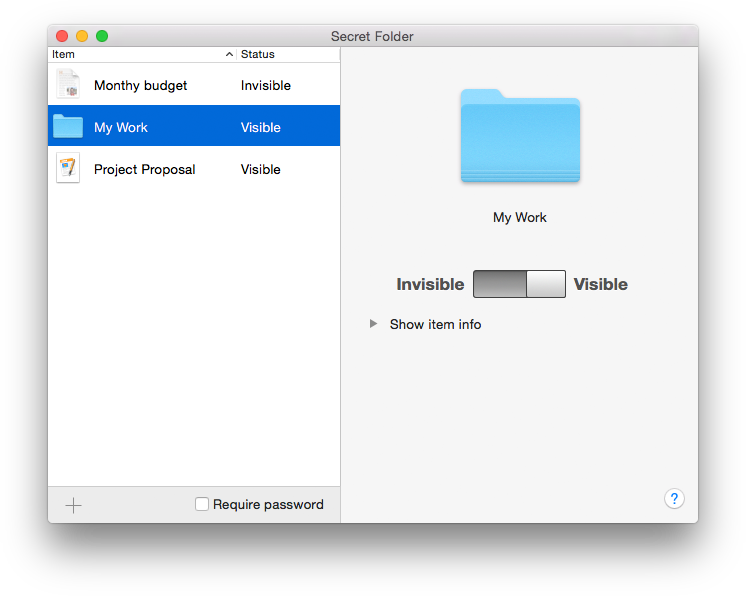 Secret Folder allow you to build a list of file and folders, which you may turn visible or invisible with a simple click. 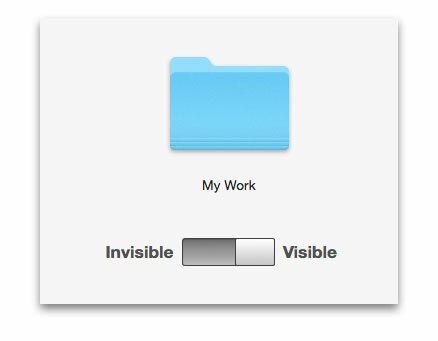 This application uses the standard functionality of the operating system to make folders and files invisible. Programmers and experienced users could gain access to a folder made invisible and there are some applications that let you open invisible files. Whether you need advanced levels for protecting your data, there are other ways as protecting information on removable media (as creating encrypted disk images by using macOS FileVault). You can learn more about data protection on Mac by visiting the protect data on Mac page on the Apple site.